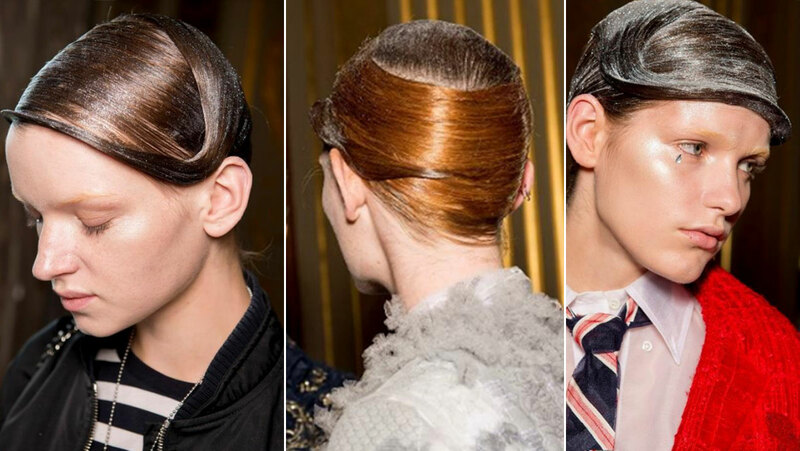 Eugene Souleiman created dreamlike fantasy hair for Thom Browne SS18 at Paris Fashion Week using tools from ghd. “This isn’t a normal show, it’s another level of fashion and I absolutely adore it. It’s a production, theatre. I love the creative side of fashion shows like this, real design. This is stuff you see in the V&A museum, it’s memorable, it’s part of fashion history and also its cultural history, fashion is a part of our culture, it’s certainly part of mine. “I received a brief from Thom Browne which was to create the appearance of models with bald heads. I started to work with that in mind but built upon it. My initial idea was something mannequin-esque, something seamless and shiny, where hair doesn’t look like hair at all. I sent him some references from a British artist, I really love called Allen Jones and it really worked. 1. To start, Eugene sectioned hair into two halves, the top section was tied into a tight bun and the bottom was left loose, this formed the base of the look. A generous amount of EIMI Stay Essential was applied throughout in order to ensure hair remained in place and was easy to mould. 2. Next, the ghd Narrow Dressing Brush ($29) was used to apply EIMI Sculpt Force to small sections of hair before being sprayed with water. Each section of hair was then wrapped around the bottom of the head and patted securely down to give the appearance of plastic. 3. Once the bottom half was secure, the top half was untied and split into two smaller sections. The first section was treated as before with EIMI Sculpt Force brushed throughout and wrapped around the back of the head to create a smooth effect. 4. The remaining section of hair, Eugene wrapped tightly around the front of the head to create ‘the ring of Saturn’. Once in place a net was held securely over the hair and the ghd Air Hair Dryer ($250) was used to create the appearance of smoothness. 5. When hair was perfectly in place, Eugene gave it one last blast with the ghd Air Hair Dryer ($250) to toughen product used and reinforce ‘the ring of Saturn’. 6. To finish the look a powder brush was used to add silver glitter to the front and sides of the hair.